Alright, alright, alright...I give up already. I have come to several dead ends in my genealogy research that I can't get out of my mind and I think I have finally come to the point where I have to pop the cork and...visit the LDS church! DUN, DUN, DUN (she sings aloud)!!!!! No, it isn't that big of a deal. Honestly, I can't really say why I have yet to utilize the LDS records as a resource. Actually, that's a lie. I know exactly why I haven't gone to a Family History Center (FHC): I'm afraid. I am not a religious person and even though I know that volunteers at FHCs do not proselytize I am still nervous to cross their threshold. I am also inherently a shy person and the idea of walking in to a strange place to do something I've never done before makes my skin crawl. 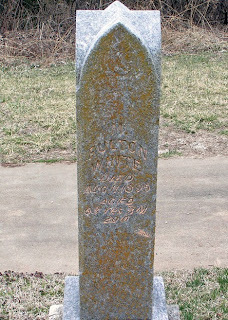 Marcellus White's headstone in Lavelock Cemetery, Hardin, Missouri. ﻿ Marcellus White. Marcellus is my third great-grandfather on my mother's side. He lived most of his life in Ray County, Missouri, and family stories state that he came from the Roanoke area of Virginia. There are no records for Marcellus in Missouri. There are no probate documents, no death record, no obituary. Not even a miscellaneous newspaper article. I have three census records and a photo of his headstone. Based on information in the book 1881 History of Ray County, Missouri, compiled by the Missouri Historical Company, I know that Marcellus served in the civil war on the confederate side. The book only mentions his participation: no unit information or state affiliation. A search on the National Park Service's Civil War Soldiers and Sailors System yields two entries for Marcellus F. White, both from units in southwest Virginia. One entry is for the 9th Virginia Infantry and the other is for Salem's Flying Artillery, both units being created in the Roanoke area of Virginia. With that information in hand I went to Footnote.com to see what records they might have. A search for Marcellus F. White finds an entire Confederate Civil War Service record. It traces Marcellus from his enlistment in Salem, Virginia in 1861 to his parole at Appomattox Court House, April 9, 1865. It is a fascinating set of documents. There is only one problem: I have no idea if this individual is "my" Marcellus. I have found several online family trees that connect Marcellus F. White of Missouri to the White family of Roanoke, Virginia. None of them include sources. I am a stickler about sources. If I can't find a source for a detail, or at least several different sources that could lead to the same conjecture, than I try to not put the information in my tree. I have one source that may link Marcellus to Virginia. An 1850 census from Roanoke, Virginia lists a Marcellous [sic] White, age 18, living with his parents: Edmond P. and Sally White. This is the only tentative link I have between the two states. I know that Marcellus is a fairly unique name, but I have found several other Marcellus Whites while searching through Virginian documents. So now we come full circle to the LDS archives. I have found many, many microfilm reels in their library catalog that may help me in all my family lines. For Marcellus I have found the resource Marriage licenses, 1838-1853; marriage register, 1853-1918 (1919), from the Roanoke, Virginia County Clerk. If Marcellus is on the document, it may contain his parents' names, or at least something a little more concrete. Plus it would verify his wife's information as well. I suppose I'll do anything for a resource, even stretch out of my personal comfort zone. Wish me luck!